With the exclusion of the headings, the below information has been taken from a 25 point walking tour of our Cathedral. 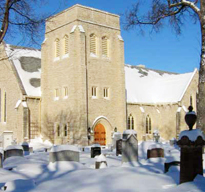 Before you take the tour, read a little background information on St. John’s Cathedral. The present Cathedral was built in 1926. Designed by Parfitt and Prain of Winnipeg, it incorporates elements of various mediaeval English design, with a Norman tower and barrel-vaulted ceiling, and Gothic arched doors and windows. Two of the stonemasons, both in their eighties, who worked on the present Cathedral had also worked on the 1862 building. In 1959, a two-storey addition was built onto the northeast corner and now houses the Dean’s Vestry and Office, the Sacristy, the Church Office and the Choir Room. We enter the Cathedral by the Tower door. The tower houses the bells, which came from the Whitechapel Foundry in London, England. They were originally installed in the third building in 1862 and are unusual in that they play the first three notes of the minor scale. Set into the interior walls of the tower are stones from other cathedrals in the Anglican Communion. In the anterior lobby, two small stained glass windows depict the third cathedral (north wall) and the first cathedral (south wall). A plaque on the wall of the staircase leading to the bell tower was mounted on the first stone building (1833). The interior lobby stained glass windows depict the first church on this site (north wall) and the second cathedral (south wall). 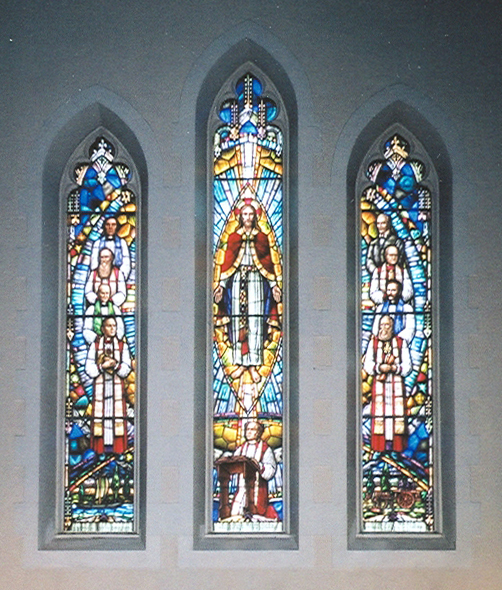 All four windows were designed by Western Art Glass. Display cases contain items from the Cathedral’s past. 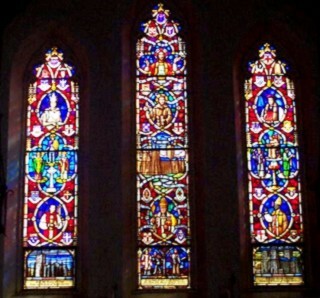 The rear of the nave is illuminated by the Great West Window, designed by Western Art Glass of Winnipeg and installed in 1970 to mark the 150th Anniversary of the Parish. 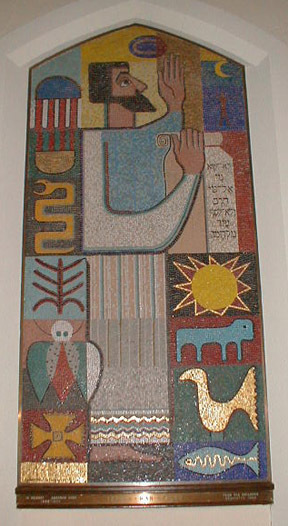 It depicts the Risen Christ surrounded by leaders in Rupert’s Land over the years. On the left, from bottom to top, are: the Most Rev. Howard Clark, Bishop of Rupert’s Land, 1961 to 1970, Primate of All Canada 1970 To 1986, the Very Rev. J. W. Matheson, Dean of Rupert’s Land, 1905 to 1934, the Most Rev. Samuel Pritchard Matheson, Archbishop of Rupert’s Land 1905 to 1931, and the Rev. Henry Budd, the first native North American to be ordained to the priesthood (1850). On the right, from bottom to top are: the Most Rev. Robert Machray, Archbishop of Rupert’s Land, 1865 to 1904, the Ven. 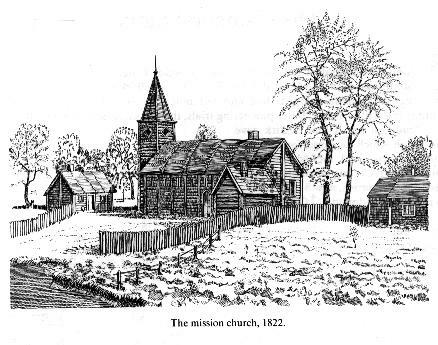 Robert McDonald, missionary to Yukon, the Most Rev. Walter F. Barfoot, Archbishop of Rupert’s Land, 1954-1961 ,the Hon. Colin Inkster, Sheriff of Rupert’s Land and Warden of St. John’s Cathedral from 1871 to 1933. In the centre panel, kneeling at the feet of Jesus is the Rt. Rev. David Anderson, first Bishop of Rupert’s Land (1849-1864), in whose memory the window is dedicated. Below the West Window is the Cathedral library, which offers a selection of books covering subjects like prayer, faith, biography, commentary, and all things theological and scriptural, along with the Visitors’ Centre and coat racks. 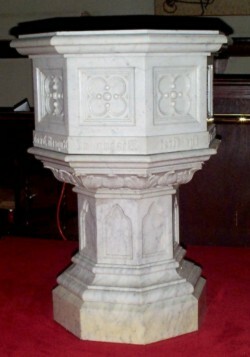 The Italian marble font at the foot of the nave has been in use since 1887 and is a gift by the parishioners of the Cathedral in memory of the Rt. Rev. David Anderson, first Bishop of Rupert’s Land. To the right of the Great West Window is a tablet erected by the students of the Red River Academy to the memory of Mary Jones, wife of John West’s successor, the Rev. David Jones. Mrs. Jones was involved in the education of girls in the Red River Settlement. She is buried in St. John’s Cemetery. The window on the wall beside the elevator depicts the baptism of Jesus. The font was originally located beneath this window, which was designed by McCausland and installed in 1926. The lobby of the Main Street door into the Cathedral also has small stained glass windows. Those in the interior lobby show St. Matthew’s Cathedral, Diocese of Brandon (south wall) and St. Jude’s Cathedral, Diocese of the Arctic (north wall). The anterior lobby windows depict St. Alban’s Cathedral, Diocese of Saskatchewan (south wall) and St. James Cathedral, Diocese of Athabasca (north wall). All four windows are by Ernest Ashcroft of Western Art Glass. As we move up the left aisle of the nave, the first window depicts the Rev. John West preaching to a group of Red River settlers, Hudson’s Bay Company employees and some highly romanticized natives. (It is unlikely that the Saulteaux, Cree or Ojibway people who occupied this area ever wore such elaborate headdresses. The artist obviously had seen too many John Wayne movies and had them confused with Seminoles and Sioux!) 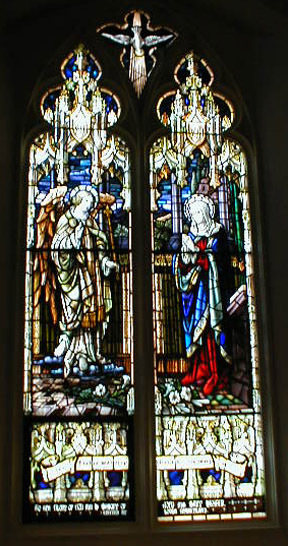 The window, by Cakebread Robey and Co., of England, was installed in 1946 as a memorial to E. L. Drewry (1851-1940), a parishioner at St. John’s for 63 years. 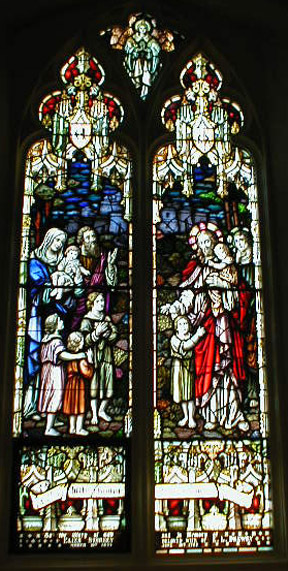 The second, third and fourth windows depict the Annunciation, the Nativity and Jesus with the children. All are by McCausland and date from 1926. The left transept (geographical west / ecclesiastical north) is dedicated to all those who served in the Canadian Armed Forces in the major conflicts of the past century. 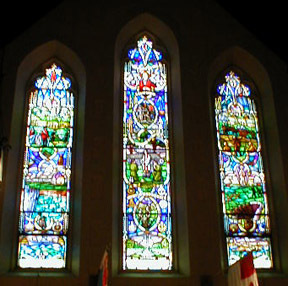 The stained glass window which dominates the transept shows scenes from every war which has involved people from Manitoba – from Batoche to the Boer War, The First and Second World Wars, and Korea. 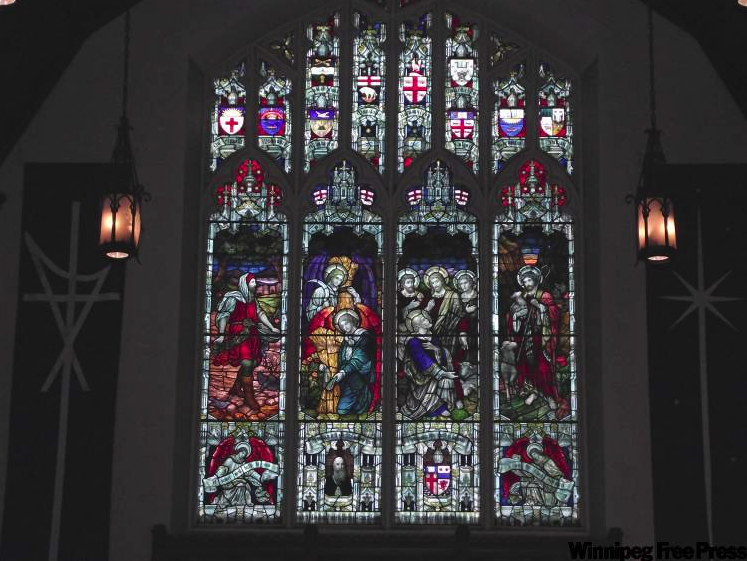 Designed by Western Art Glass of Winnipeg, it was dedicated on October 19, 1975, to the Glory of God and in tribute to the armed forces of the Winnipeg Command. 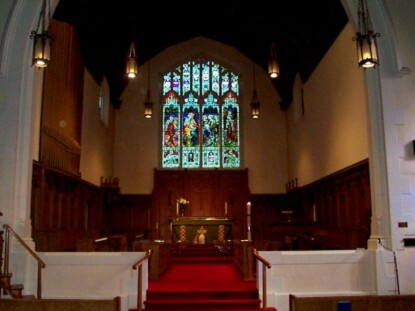 The Cathedral is the regimental church of the Royal Winnipeg Rifles (The Little Black Devils) and the regiment’s drum and bugle is housed in a cabinet in the transept. 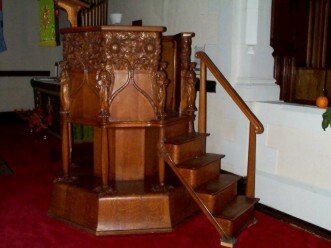 The octagonal pulpit is made of oak salvaged from the former Bishop’s Court. It was hand-carved by R. Dien, a Swiss artist, and presented to the Cathedral in 1907 by John Machray K.C. Ain loving memory of Robert Machray, Archbishop of Rupert’s Land, A.D. 1865-1904. The figures on the intricately carved pulpit represent joy, peace, love, faith, humility and hope. It is a tribute to Dien’s artistry and mastery of his craft that, despite the fact that oak is a hardwood, and would not be the first choice of any one who wanted to carved intricate figures and flowers, such minute details as feathers on the wings, and the finger and toenails of the figures are perfectly reproduced. Above and behind the pulpit is a Canterbury Cross, a gift from The Friends of Canterbury Cathedral. The cross, which is mounted on a stone taken from Canterbury Cathedral, was installed in 1935, after being blessed at Canterbury Cathedral at the Empire Service, June 15, 1935. Identical crosses were given to all cathedrals extant at that time in the (then) British Empire and the United States. The chancel is panelled in oak and at the top of each panel is a Christian symbol – wheat, grapes, nails, a crown of thorns, for example. In the sanctuary, the oak panelling, the Cathedra (Bishop’s chair) and Sedilia (Canons’ chairs) were gifts of the Ladies Aid Society in 1929. 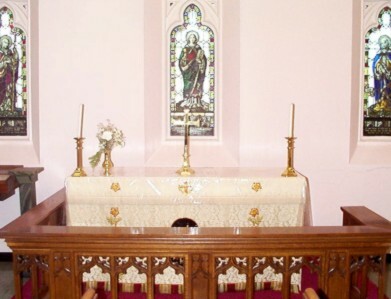 Off the chancel is a small chapel, used for early services on Sundays, for quiet days, and for services during the week The aumbry, wherein is stored the holy oils and the reserved sacrament, is housed in the chapel. 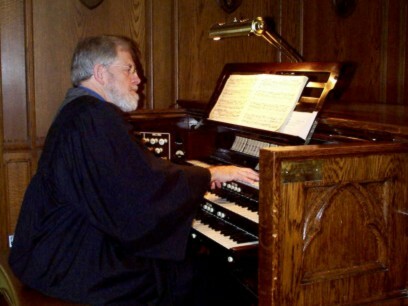 The Casavant pipe organ was installed in 1927, a gift of the Ladies’ Aid, and cost just over $8,000.00. Its replacement value is roughly three-quarters of a million dollars today! The brass eagle lectern has been in place since 1890 and was given to Archbishop Machray to mark the 25th year of his episcopate. 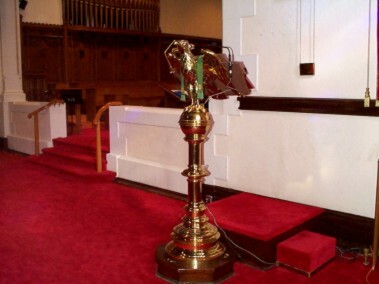 The eagle is a common form of lectern in the Anglican Church, and the understanding is that an eagle facing left signifies that the parish holds to the high church tradition of the Anglican Church, an eagle staring straight ahead signifies that the parish is neither high nor low but broad church (or via media), and an eagle looking to the right indicates that the parish follows the low church or evangelical traditions. The Cathedral’s eagle looks straight ahead. The Great East Window over the high altar features the coats of arms of all the Anglican Dioceses in Alberta, Saskatchewan, Manitoba and Northwestern Ontario that were in existence at the turn of the twentieth century, along with the coats of arms of the Hudson’s Bay Company and the Province of Manitoba . It was designed by Cakebread Robey and Co. of England and installed in 1932 as a memorial to Archbishop Machray. Machray’s portrait is shown in one of the lower panels. Moving toward the back of the nave on the geographical east / ecclesiastical south wall, we find a large stained glass window in the south transept, by Western Art Glass, featuring notable figures in Anglican Church from Bede to Archbishop Luwum who was assassinated by the Idi Amin regime in Uganda. Look closely and you’ll find the Queen (this is believed to be the only stained-glass portrait of Her Majesty in Canada). On a visit to St. John’s, Prince Philip pronounced the portrait of her Majesty A very good likeness! Others featured in the window are Thomas Cranmer, who was the chief author of the Anglican Book of Common Prayer, and bible translators Wycliffe and Tyndale. Saints Bede, Augustine, Alban, David and Patrick are also shown. 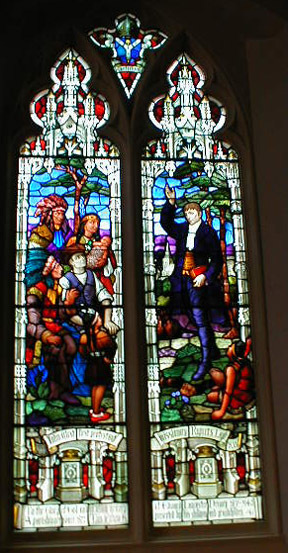 Also depicted are Donald Coggan, who was the Archbishop of Canterbury when the window was designed, and John Ogle Anderson, former Dean of Rupert’s Land, later Suffragan Bishop of Rupert’s Land and Bishop of British Columbia. The Cathedrals of Jerusalem, Canterbury and Washington are also shown. Below the South Window, to the right, is a plaque bearing the Coventry Cross of Nails, presented to the cathedral in 1953 by the Very Rev. R.T. Howard, then-Provost of Coventry Cathedral in England. The nails were salvaged from the ruins of Coventry’s Gothic Cathedral, destroyed by bombs during World War II. The Cathedral’s Baldwin grand piano, which is over 60 years old, is also in the south transept. 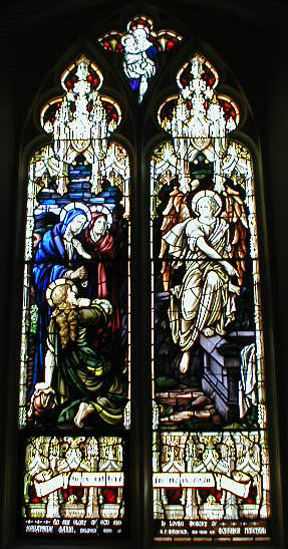 The Resurrection window is dedicated to the memory of Seraphine Marie Matheson, wife of Archbishop Samuel Pritchard Matheson, and their son Mortimer. 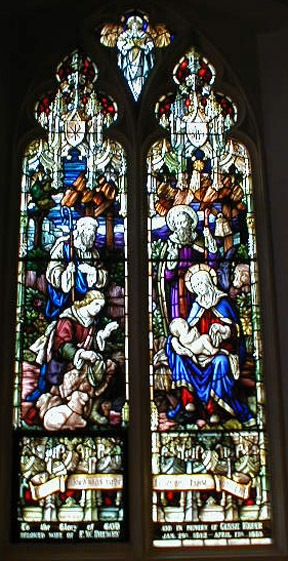 Mrs. Matheson and the infant Mortimer are shown, in the guise of Mary and the infant Jesus, in the panel at the top of the window. The window was designed by McCausland. 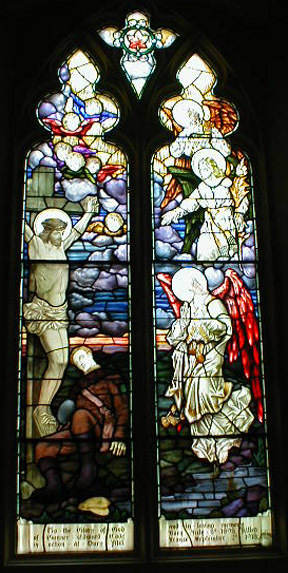 The Crucifixion window is an Art Deco design by Jones and Willis of London. It was installed in 1927 as a memorial to Edward Code, who was killed in France at age 20 in 1918. Young Code is the soldier lying at the foot of the cross. 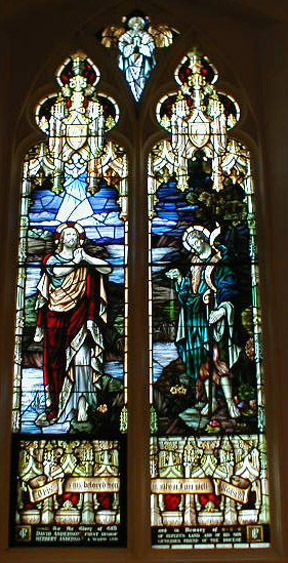 Jesus calling the disciples is the subject of the third window on the south wall. It, too, is a McCausland window. It is a memorial to Hope Campbell Triggerson, whose portrait appears in the panel at the top of the window. Two mosaics dominate the south wall on either side of the tower entrance. Designed by Lionel and Patricia Thomas of Vancouver, who took their theme Apraise and magnify the Lord from the Benedicite, Omnia Opera, Book of Common Prayer, the mosaics depict Isaiah, the Prophet and Man of God, and Christ, the Son of God, the fulfilment of the prophecy. 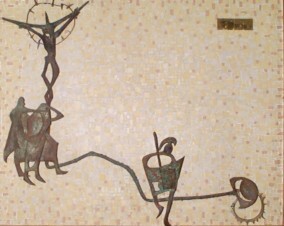 The mosaics were dedicated in 1959 in memory of Abraham and Gertrude Code. The sacristy is home to a piece by Leo Mol, noted Canadian sculptor. It is the maquette of the sculpture which was installed on the north exterior wall of St. John’s College on the University of Manitoba campus.